All-Time Series: Clearfield and Berwick have never met. In fact, Berwick is the first team from District 2 that Clearfield has ever faced. – The Bison have won 52 of their past 57 games and are the fifth team in school history to reach the PIAA quarterfinals. With a win Friday, Clearfield would reach the state semifinals for the first time in school history. – Clearfield enters Friday’s game as the 10th-ranked team in the state according to the Pennsylvania Football News, while Berwick checks in at 6th. – When Curry’s record is combined with Clearfield coach Tim Janocko’s 229-97-3 career mark, Friday night’s game will feature a total of 665 coaching wins between the two men on the sidelines. – The Bulldogs have captured 6 state championships since the PIAA began a statewide playoff in 1988. They also fell in the finals to Perry Traditional Academy 20-8 in 1989. Three Berwick teams have been named national champions by USA Today: 1983, 1992, and 1995 (information courtesy of http://www.hsfdatabase.com/nationalchampions.htm and http://www.tennprepdb.com). Click on each year to view the final USA Today national rankings. For reference, Clearfield’s all-time record dating back to 1904 stands at 546-460-37. – Friday’s game will be played at 7 p.m. at Central Mountain High School in Mill Hall. The winner will advance to the Eastern Final to take on the winner of the Archbishop Wood (10-2) and Academy Park (10-2) game that will be played on Friday at 7 p.m. at Northeast High School in Philadelphia. Archbishop Wood is the District 12 champion and won the state title in 2011, while Academy Park is the District 1 champion. The entire PIAA Class AAA bracket can be viewed here. – Clearfield has now won 52 of its last 57 games. The Bison are 11-3 in the postseason over the past four years and 21-20 all-time. The 2013 Bison are now the second team in school history with 13 wins, joining the 2010 squad. This is the fifth time Clearfield has made it to the PIAA quarterfinals, joining the teams from 1994, 2002, 2008 and 2010. – The 2013 Bison became the first team in school history to eclipse 4,000 yards rushing (4,265) and 5,000 yards of total offense (5,112). They also extended their school records to 528 points scored, 661 rushing attempts, and 62 rushing touchdowns. – Christian Lezzer’s 22 carries Friday night gave him the school record for rushing attempts in a career (571). His career rushing statistics are 571 carries for 4,207 yards and 66 rushing touchdowns. Lezzer’s 93 career rushing plus passing touchdowns are just two behind Chad Kroell’s school record of 95. He is also 3 rushing touchdowns from tying Dave Richards’ school record for a career. With 105 yards rushing next week, Lezzer would join Richards as the only two Bison players to reach 2,000 yards rushing in a single season. – Tyler Stratton now has 2,417 career rushing yards, putting him 76 yards behind Stu Wiggins for 5th place on the all-time list. He became the 11th Bison to rush for at least 20 touchdowns in one season and has scored 39 touchdowns overall during his career, good for a tie for 6th place all-time with former All-State running back and Indiana University fullback Vic Jones. – The Bison have held 6 consecutive opponents to under 10 points and have outscored opponents this season 528 to 165 (an average score of 40.6 to 12.7). – Clearfield now moves on to face state-ranked Berwick (13-0) Friday night at Central Mountain High School. Berwick has won 6 state championships and defeated Bethlehem Catholic 29-27 on Friday. Berwick won District 2 this season, meaning that Clearfield has now faced a representative of every PIAA district except for District 1 (suburban Philadelphia) and District 12 (Philadelphia Public and Catholic leagues). The winner of the Clearfield-Berwick game will meet the winner of the Archbishop Wood-Academy Park game with a trip to Hershey and the state championship game on the line. The up-to-date AAA bracket can be seen here. *Note: The Progress began tracking individual player defensive statistics in 1993; because Clearfield and Jersey Shore last met in 1979, there are no records of individual defensive statistics for the 30 games played between the Bison and the Bulldogs. – Clearfield has won 51 of its last 56 games. The Bison are 10-3 in the postseason over the past four years and 20-20 all-time. A win Friday would mark the school’s second 13-win season, joining the 2010 Bison. – Clearfield enters the game ranked 10th in AAA by the Pennsylvania Football News. This is the first time the Bison have been ranked by PFN since they were 10th in the final state AAA rankings following the 2010 season. – The Bison currently average just 7.2 pass attempts per game, the lowest since the 1957 team attempted 6.3 passes per game. Last season was the first time since 1978 that Clearfield did not attempt at least 10 passes per game. Clearfield is also currently averaging 3.2 completions per game. This marks the lowest average by a Clearfield team since the 1978 team completed 2.5 passes per game. By comparison, the Bison averaged at least 6 completions per game each season from 1982 to 2000 and averaged at least 10 completions per game 8 times from 1985 to 1994. – Jersey Shore is led by former Bellefonte head coach Tom Gravish. Gravish coached the Red Raiders from 1999 to 2006 and went 2-7 against Clearfield during that span. One of his wins included the only postseason meeting between Clearfield and Bellefonte, a 27-10 win for Gravish’s team in the 1999 state playoffs. – According to http://www.d9sports.com, Clearfield will make its 16th state playoff appearance Friday night, putting it in sole possession of the most appearances in the entire district. Smethport and Clearfield both had 15 all-time before the Bison beat Somerset to ensure another game. Friday’s game in DuBois will be Jersey Shore’s first state playoff game since 1997. – The winner of the Clearfield-Jersey Shore game at E.J. Mansell Stadium in DuBois will take on the winner of Berwick-Bethlehem Catholic next week at a site and time to be determined. Berwick (12-0) and Bethlehem Catholic (8-4) square off at J. Birney Crum Stadium in Allentown. The full state AAA playoff bracket can be found here. – Clearfield has now won 51 of its last 56 games. The Bison are now 10-3 in the postseason over the past four years and 20-20 all-time. The win pushed Clearfield’s record to 12-0, making them the third team to reach one dozen wins in school history. The 1994 (12-1) and 2010 (13-1) teams also reached the 12-win mark. – According to Josh Funk, the editor-in-chief of the Pennsylvania Football News, Clearfield enters the AAA Top Ten for the first time this season following Friday night’s win. AAA: West Allegheny & Central Valley are 4-5; Archbishop Wood 6, Berwick 7. Academy Park & Clearfield are 9 & 10, respectively. – Christian Lezzer now sits at 4,053 career rushing yards, making him only the second Bison to surpass 4,000 career yards (Dave Richards – 4,639). Lezzer’s 549 career rushing attempts puts him just 15 carries from tying Richards for the school record. According to http://www.d9sports.com, Lezzer became only the 5th player in District 9 history to rush for 4,000 yards and score 70 touchdowns in a career. He joins Richards, Curwensville’s Nick Sipes and Alex Holland and Clarion’s Kyle Cathcart. – Tyler Stratton reached the 1,000 yard rushing mark for the second consecutive season and now sits at 1,112 yards for the 2013 season despite the fact that he has missed significant stretches due to injury. In the 6 games in which Stratton has registered at least 10 carries, he has averaged 157.7 rushing yards per game. He sits just 2 yards behind Ken Wisor for 7th place all-time in rushing yards; Stratton will enter the Jersey Shore game with 2,311 career yards. – The Bison defense has held five consecutive opponents under 10 points, the school’s longest such streak since the 1955 team shut out its first five opponents. The 2013 Bison have held 9 of their 12 opponents to 15 points or fewer and have picked off 11 passes in the last five weeks. – Clearfield now has 501 points scored this season, making them the first team in school history to eclipse 500 points scored. This year’s Bison currently hold school records in points scored (501), rushing attempts (611), rushing yards (3,965), rushing touchdowns (58), and total yards (4,774). – The Bison will now meet Jersey Shore (6-6) in the first round of the PIAA playoffs Friday night in DuBois. Clearfield and Jersey Shore have played each other 30 times but haven’t met since 1979. Updated PIAA brackets for the AAA classification can be seen here. Because these two teams have never played one another, this preview will look different than other pregame posts. We don’t have any historical records of Bison performances against Somerset, so this preview will contain a longer Notes section than other previews. I’ve listed a comparison of Clearfield and Somerset’s team statistics for this season below; all statistical information for Somerset comes from http://www.maxpreps.com. – Clearfield has won 50 of its last 55 games. The Bison are 9-3 in the postseason over the past four years and 19-20 all-time. 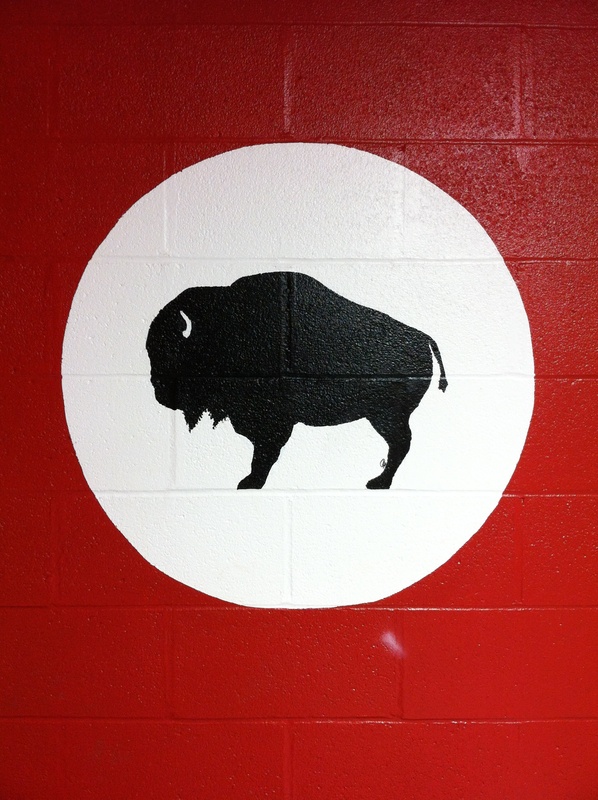 – Somerset will be the 81st different opponent Clearfield has faced in the 109-year history of Bison football. Included in the 80 opponents Clearfield has played before its game against Somerset are 4 colleges (Peterson Business College and the forerunners to Clarion University, IUP, and Lock Haven University), an American Legion team (in 1921), and a Clearfield football alumni team in 1926 (the alumni won, 13-0). In addition to these teams, Clearfield has squared off against 74 high schools, some of which have been on the schedule for 80 years or more, some that were only played a few times, and some that merged with other schools or no longer exist. For the purpose of this website, Philipsburg and Osceola were counted as two different schools because the Bison played both before the two merged in the 1950s; Philipsburg-Osceola was also counted as a separate school. The same method was used for other mergers with teams Clearfield had played, such as the Indian Valley-Lewistown merger to create Mifflin County High School. A huge thanks for this information goes out to Coach Kristofer Albright for compiling all of Clearfield’s games since 1904 at http://www.clearfieldfootball.org. – Somerset is a member of District 5 but plays a schedule that is almost exclusively District 6. After Friday’s game, Clearfield would have played a current member of Districts 3, 4, 5, 6, 7, 8, 9, 10, and 11. The only districts that Clearfield has not competed against are District 1 (suburban Philadelphia), District 2 (Scranton/Wilkes-Barre area), and District 12 (the Philadelphia Public and Catholic Leagues). – In last week’s 42-7 win over Johnstown, Seth Ford became Clearfield’s all-time leading tackler since the statistic was first recorded in 1993. Ford now has 224 career tackles, pushing him ahead of Matt Meckey’s 223 tackles from 1998-2001. – The winner of Friday’s clash in Hollidaysburg will take on the winner of the District 4 AAA championship game between Jersey Shore and Selinsgrove at a date, time, and place to be determined. The statewide AAA playoff bracket can be found here courtesy of http://www.westernpafootball.net. – Clearfield has now won 50 of its last 55 games. The Bison are now 9-3 in the postseason over the past four years and 19-20 all-time. Clearfield is now 3-1 versus Johnstown since the two schools first met in 1919 and 3-0 since the 2010 season. – The Bison now have a school record 3,658 rushing yards this season, besting the 3,655 yards racked up by the 2011 team. Clearfield’s 4,436 yards of total offense are the 5th most in school history; the 2008 team accumulated 4,727 total yards over 13 games. Finally, Clearfield has scored a school record 480 points this season in their 11 victories. – Christian Lezzer’s 1,567 rushing yards this season ranks 6th on Clearfield’s single-season rushing yardage list and is just 28 yards behind Isiah Morgan for 5th place. Lezzer is also 121 rushing yards away from 4,000 for his career. His 50 yards passing Friday night pushed him to 2,012 yards through the air in his career, making him the 12th Bison to pass for more than 2,000 career yards. Lezzer has accounted for 88 passing or rushing touchdowns in his career. – Tyler Stratton is now just 8 rushing yards shy of 1,000 for the season. Stratton would become the 6th Bison to rush for 1,000 yards multiple times in his career, joining Lezzer, Dave Richards, Josh Harbold, Stu Wiggins and Isiah Morgan. He also passed Derek Morgan for 8th on the all-time touchdowns scored list with 36. Stratton is two touchdowns behind Derek’s brother Isiah and three behind Vic Jones for 6th place on the list. – The Bison will now face Somerset at 7 p.m. Friday in Hollidaysburg. The Golden Eagles are 10-1 and knocked off District 8’s University Prep at Cupples Stadium in Pittsburgh by a score of 28-20. Clearfield and Somerset have never played one another. – Clearfield has won 49 of its past 54 games overall and is 8-3 in the postseason since 2010. – While the Bison and Trojans have played only twice since 1937, the two schools also squared off in 1919, a 6-3 Johnstown win. Johnstown is also one of 6 schools that Clearfield has played that were part of the WPIAL at one time or another; the Trojans won the WPIAL title in 1958 over Clairton. Other Bison opponents through the years to participate in the WPIAL include Altoona (current member), Hollidaysburg (current member), and Indiana (current member). The Bison also played Shannock Valley, which was consolidated into West Shamokin, another former Clearfield opponent. – With a win Friday night, Clearfield would secure its 6th 11-win season in its history. Other Bison teams to win 11 or more games were the 1994, 1998, 2010, 2011, and 2012 seasons. – The winner of Friday’s Clearfield vs. Johnstown game will play the winner of the Somerset vs. University Prep game next week for the District 5/6/8/9 subregional final.